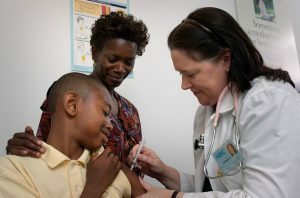 The following links to CDC and Ohio Department of Health provide information on the recommended ages for routine childhood and adult vaccinations. Check back often for updated schedules and changes to vaccination requirements. A catch up schedule is also available for missed or late doses. It is also important to keep immunization records up-to-date, for both children and adults. Immunization schedules are usually kept at your doctor’s office and filled in when you or your child gets vaccinated. But it’s also important to keep up-to-date copies at home in a safe place because proof of immunization is required when children start daycare or kindergarten. It will also be easily accessible for emergencies. Ask your pediatrician or doctor for a copy of your family’s immunization records, and take it with you each time a family member is immunized. As of 2016-2017 SCHOOL YEAR: The State of Ohio requires all incoming seventh and twelfth grade students to submit proof that they have had the meningococcal vaccine before starting the 2016-2017 school year.